Marathi plays are well known. Most Sunday chai – time gupshup includes references to plays which the members of the group have seen either as children or in their college days. But shameful though it is, I must admit that I saw my first play at the age of 25. Or make it second. The first I had been to was ‘All the Best’ when I was 6. I wouldn’t say I watched it because it slept through it! So the first one I watched was after 19 years. It was ‘Saasu mazi dhaasu’. I have never been very enthusiastic about watching plays & I agreed to this one because it had Reema Lagoo & I love that woman! 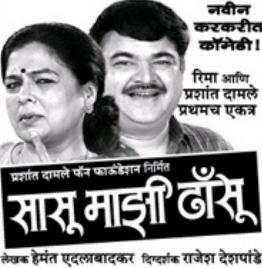 The play is produced by Prashant Damle fan club. I am not a Damle fan but had enough faith in Reema & hence went ahead & booked my tickets. Paid Rs. 2 extra as I had booked on the internet! The ticket costs Rs. 200. You can book tickets for Prashant Damle shows online by going to: http://www.prashantdamle.com/. The play basically has no story. It’s just a comedy, so if you are looking for logic, story, etc give it a miss. It’s a 2 part play. Damle is the son –in – law. His wife is Neeta Pendse. The play is written by Hemant Edalabadkar & is directed by Rajesh Deshpande. Reema is naturally the dhasu MIL. Damle & his wife had eloped 5 years ago & had gotten married. Hence Damle is terrified of now meeting his MIL. For not only does he fear his past elopement but also because he owes some lakhs of rupees to a bank & a local goon. The story takes many twists & turns when Damle calls his friends house his own in order to impress his MIL & in turn borrow some money from her. He gets another person to impersonate himself. The final twist comes when Reema reveals her own secret! My take: Watch it if you want to laugh! Not much logic, nor much story, but it’s certainly a good laugh. The jokes are fresh, not cheap (as is normal with Marathi jokes these days) & DO make you laugh (a feat in itself). Reema's entry is greeted with an applause from the crowd. She looks beautiful in a 9 – yard saree throughout the play. I liked Damle as well. He makes baby – faces at times which I did find cute! A 3 on 5 for this one!